Part of the charm of Macworld/iWorld’s Appalooza is that it’s mostly filled with software developers that are small companies; sometimes they are operations of one, two, or three people. Jera Design is one of those companies, with John Brewer manning his booth to show his latest app, ResistorVision. ResistorVision does one thing: It identifies resistors. 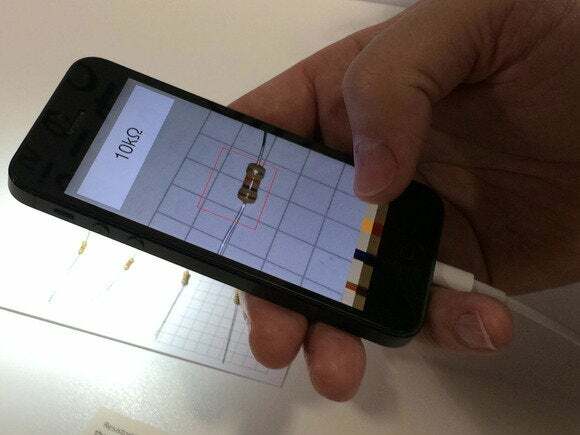 But instead of deciphering color codes or using a reference chart, ResistorVision uses your iPhone’s camera to “look” at the resistor and identify it in real time, no network connection required. ResistorVision is still under development, but Brewer says he will offer the app at a special introductory price (probably $2) when it is ready. Brewer also did a short demonstration of WristVision, a Pebble OS app that can stream video from the iPhone’s camera to a Pebble watch. The video isn’t of high quality, but it was a nifty thing to see.